A trip to Bangkok is like being caught up in a sensory whirlwind. The climate is steamy, the streets are wonderfully chaotic and the food is a tapestry of exotic flavours and unfamiliar spices. Amidst the skyscrapers and megamalls, the traditional Thai way of life is still in full swing in the countless markets and street vendors that pepper the city. Temples, of course, are synonymous with Bangkok, and the golden Buddhas and towering steeples offer a pleasing contrast to the city's modern aesthetic. In a land where temples reign supreme, Wat Pho might just be the most impressive. Situated right next to the Grand Palace, the enormous complex offers you superb insight into Thailand's spiritual connection and the mastery of its architects. The crowning glory of Wat Pho is undoubtedly the Reclining Buddha. Measuring in at 15 metres tall and 46 metres in length, the imposing statute sure is a sight to behold. 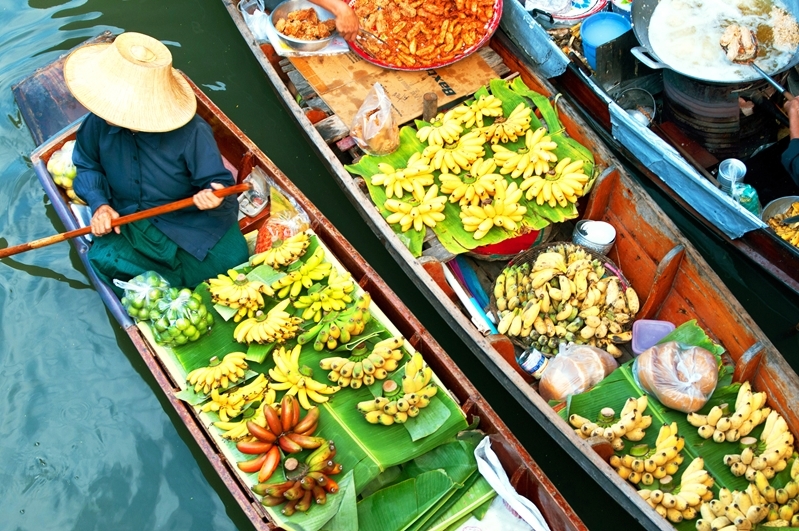 Thailand's thriving marketplaces are a sensory feast. 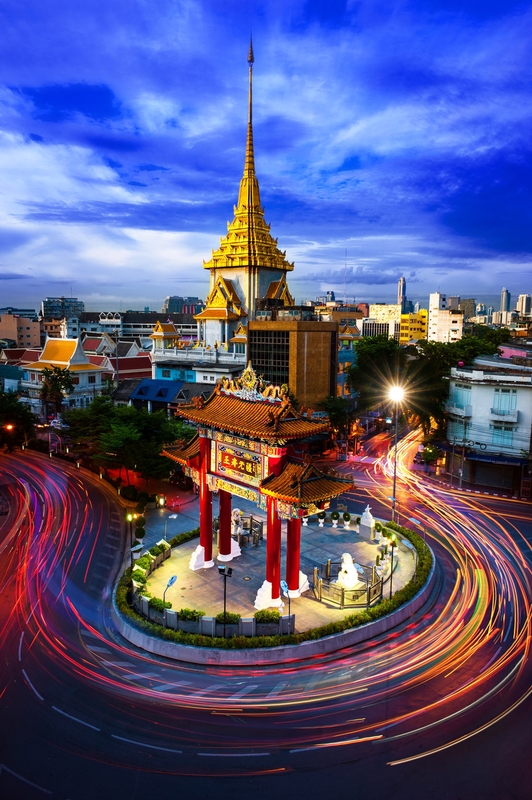 From the glitz and glam of the city's shopping malls to the thriving pandemonium of its markets, Bangkok is not the place for recovering shopaholics. Many bazaars have rightfully earned themselves reputations as tourist traps, so for the real deal you'll want to head to the Chatuchak Weekend Market. One of the largest in the world, the market comprises some 15,000 stalls spread out over 27 acres, and attracts vendors from all over the country. From jewellery to furniture and everything in between, this authentic marketplace has everything you could ever want – and all without the typical tourist price tag. The major waterway that flows through the heart of Bangkok was once the bloodline of the city in times gone past. It still plays an important role today, with ferries providing transport to thousands of local workers every day. The water might not be crystal clear, but taking a tourist boat across the river is a great way to get around and also offers some superb photo opportunities of the city at night. An unlimited day pass costs around 150 baht. One temple experience is simply not enough. 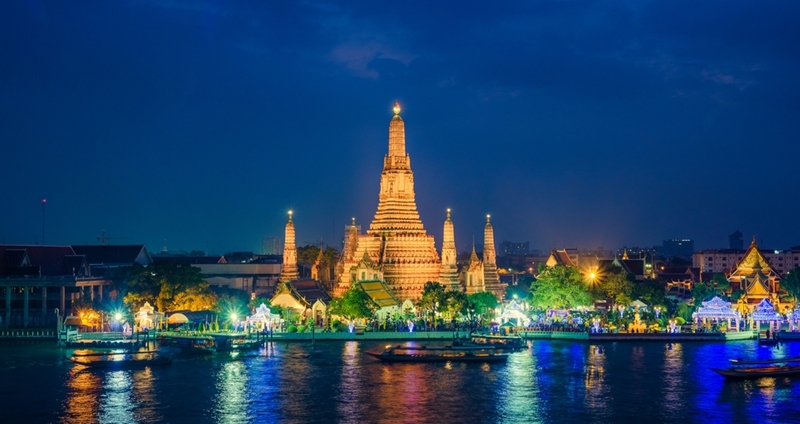 On your second morning in the city, head to Wat Arun, the Temple of Dawn (which, confusingly, is not actually open at dawn) and check out the intricate details carved into the facade of the temple walls. More than 70 metres in height and adorned with a kaleidoscope of coloured glass, this is one of the most beautiful temples in the country. Sunset offers the best views, but try to come in the morning to avoid the crowds. Temples are an integral part of Thai culture. Thailand's art scene might be best known for its traditional paintings and sculptures, but in recent times the country's artists have shifted towards a contemporary aesthetic. Nowhere is this more evident than at Bangkok's Museum of Contemporary Art (MOCA). This world class gallery houses more than 800 works, curated by telecom magnate Boonchai Bencharongkul. Equal parts beautiful and thought-provoking, this is an essential addition to any culture vulture's itinerary. If you find yourself falling in love with Thai cuisine, you'll be pleased to discover a plethora of cooking classes in Bangkok. Shop for your ingredients in a nearby market before learning the secrets behind local favourites such as pad Thai, massaman curry, green papaya salad and many more. Take the taste of Thailand back home and amaze your friends and family.